I have to warn you, I am on a diet.. so most of my food posts will be yummy, but healthy. Coming home from a month in Europe, and my jeans are screaming for help. We've all been there, admit it. But I embrace times like these, because my creative juices are called out to flow, and I can think out of the box and invent, and reinvent healthier versions of my favorite recipes - culinary indulgence without the guilt. 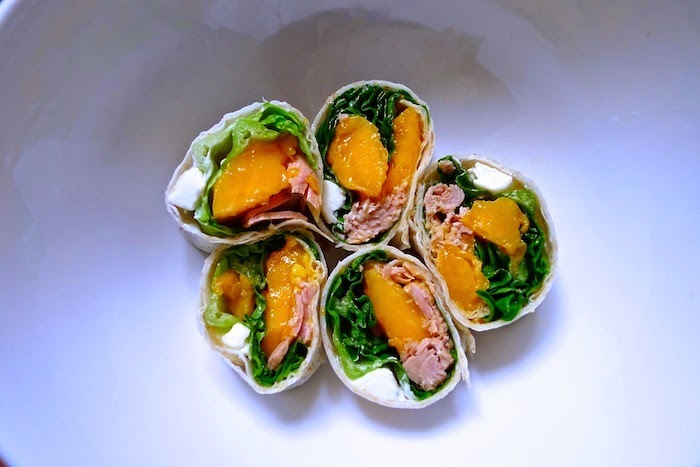 I personally love making wraps, because it's oh-so uncomplicated, and you can add your favorites and subtract ingredients you don't favor. This meal took about 3 seconds to make, and its as easy as ABC. Who doesn't love a lazy little recipe! Lay out flour tortilla, and start assembling. You have to remember that you can't pack as much into the roll, because it will become uneven, and will be hard to cut up into pieces. Place all your ingredients along the center of the tortilla, careful to distribute it, so you don't leave gaps. Roll up tightly all the way.